The Syracuse Go Club had its largest turnout ever for a weekly meeting on Monday, June 13, when 14-year-old Zhangbokan “Tony” Tang 7d played a simul against all comers. 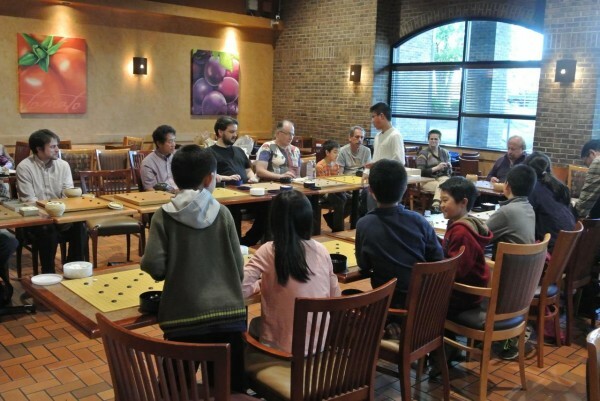 Tang, recent winner of the Maryland Open, faced 17 opponents, giving handicaps ranging from 4 stones (for 1 dan players) to 13 (for 20 kyus) — seven other players chose to watch. Only three of his opponents emerged victorious, but a good time was had by all. Tang, who is staying with a host family in Syracuse for three more years until he finishes high school, is about to return to China to visit his family for a few weeks, but he will be returning in time for the US Go Congress, accompanied by his teacher Weijei Jiang 9P.